Brass Mash performs all your favorite tunes mashed into an energetic and infectious groove. With powerhouse instrumentals and a tight sound. The band consists entirely of horns, winds, and percussion to play a variety of music styles, creating the sound of everyone’s favorite party rock band with an authentic live stage presence. Known to bring any crowd to its feet, the Brass Mash style blends or "mashes" two or more songs at a time. These compositions cross bothgenres and decades, creating a live guessing game for audiences to 'name that tune'. Britney Spears and Black Sabbath? Check. Lorde and Dr. Dre? Got that too. Daft Punk and ZZ Top? Wildest dreams are manifested through a unique vocal and saxophone talk box duet. Comprised of San Luis Obispo musicians, the band has performed throughout SLO county since its formation in 2015. Brass Mash has enjoyed playing a variety of stages including Live Oak Music Festival, SLO Brew, Mission Plaza, Templeton Concerts in the Park, The Siren, craft beer festivals, weddings, and of course Thursday nights at Frog and Peach Pub. 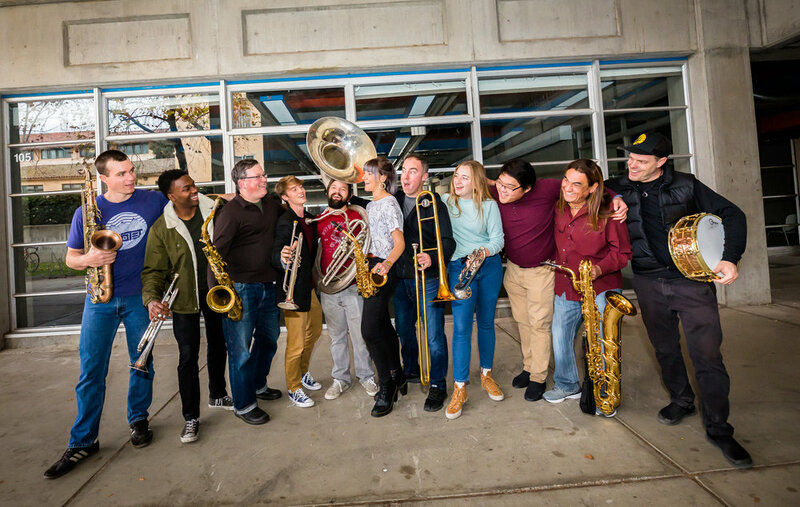 The band was honored to perform at the 2018 SLO New Times Music Awards, and also has opened for notable acts including The Soul Rebels.